Hyundai has reintroduced what is arguably their most famous offering in India. But, with the competition being fiercer than ever before, will the new Santro be able to relive the success of its predecessor in the ultra-competitive Indian market? The history of the Santro, and the way it established Hyundai as a brand in India, could very well be a case study for business schools. A new brand in a new market, hitting instant success with its first product is the kind of dream that lulls business moguls to sleep at night. And a look at the original Santro’s sales numbers is enough to understand the true meaning of success – after all, they sold 1.32 million units of the original in India alone. Despite an unconventional appearance, the Santro single-handedly laid the foundation in India for what the Hyundai brand has transformed into today. And 20 years later, Hyundai India has become the undisputed second-largest carmaker in the country, with sales numbers increasing every year. But, to penetrate the market further, they need a new hatchback – a segment that still commands the vast majority of sales in India. Part of this need is also the fact that the Eon couldn’t bring in the sales numbers the company expected from it, leaving a void for that Hyundai needed to fill urgently. In comes the new Santro – a product they’ve been building anticipation over for the past few months now, and first impressions are nothing less than admirable. The new car is based on a new platform, with a 1.1-litre petrol engine from the i10 – the only engine choice offered – albeit with major revisions to increase efficiency and to also ensure that the engine meets the BS VI norms that come into effect in April 2020. Design wise, the new Santro looks quite impressive – with a massive grille at the front that makes a definite impression. The rear end too is well designed, if not a little bland, with the top-spec Asta version’s standard rear-view camera and rear parking sensors making their presence felt in terms of equipment. However, some of the design elements on the sides of the car didn’t impress me much. While the large glasshouse helps make the interior feel roomy, the silly indent running across the front fender and door looks quite overdone and, frankly, unnecessary. However, with its imposing front and clean rear, the overall design is quite good and sure to attract attention. The interior, in typical Hyundai fashion, is well-designed. The car comes quite well equipped with lots of segment-first features. The gearshift is mounted in a similar manner as the i10, at a location that’s very convenient for your hand to rest naturally. The entertainment system, on the top end variant, is a 7-inch touchscreen with Android Auto and Apple CarPlay. Safety wise, the Santro does well, as all trim versions are equipped with ABS and EBD as standard. However, all trim versions only feature a single airbag, while only the top trim offers two. The one aspect of the interior that truly impresses is the space management. With scooped out door pads, a lower seating position and other tweaks, the new Santro truly has some fantastic interior head, shoulder and leg room for its size. Even if you’re 6-feet tall, adjusting the driver’s seat will be a breeze, and even if you’re seated in the rear seat there’s legroom to spare. However, given its width, five occupants in the Santro are going to be a tight fit. For four, however, it ideal. Also, the plastic quality and general fit-and-finish of the interior, which is offered in two shades, is clearly class-leading. Six of the seven colours of the car come with a dual-tone finish with golden highlights, but the Diana Green variant has an all-black dashboard with interesting neon green detailing on the dashboard, the seatbelts and unique stitching on the seats. Coming to the driving experience, I was particularly impressed by two aspects of the car. First, we finally have a Hyundai with excellent steering feel and feedback – yay for that! The steering – which is electrically powered – feels absolutely natural, transmits lots of information and has none of that synthetic feel that reminds you of previous models from the Korean brand. This is fantastic progress in the age of electrically powered steering systems, and something I’m very happy about. 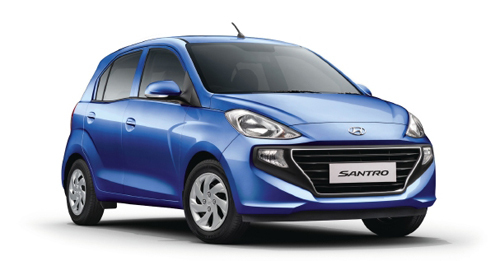 Second, the new Santro offers two transmission options – a 5-speed manual and a 5-speed AMT. The manual is a revised version of the i10’s gearbox and works well with well-defined gearshifts. However, it’s the AMT that’s absolutely brilliant. Developed and manufactured in-house by Hyundai, the AMT differs from other AMTs in the sense that the automated shifting actuator is electric in nature – rather than hydraulic, which is the norm. Now, I’m not qualified enough to comment on how that improves the AMT’s response, but the AMT in the Santro is the best Automated Manual Transmission that I’ve ever had the chance to drive. The upshifts are fantastic and don’t require lifting your foot off the throttle like other AMT’s, and the downshifts, well, they’re just natural and seamless. This, in my opinion, is the closest an AMT can get to a regular torque converter automatic in terms of response time and shift smoothness. It’s a very welcome improvement in the world of affordable automatic transmission cars – something our market needed quite badly. During our test drive – on particularly smooth roads from Bhubaneshwar to Konark – the Santro was well planted at high speeds and body roll was quite manageable with good steering response. And, on some broken roads that we encountered, the ride quality proved to be very good as well for a car of its size. The 1.1-litre engine in the Santro feels quite good too. It revs eagerly, has good refinement and gains speed quickly. Claimed efficiency numbers are also impressive, at over 20km/l. Also, the new Santro will be available with a factory fitted CNG kit from day one – a first for the brand, as earlier Hyundai only sold CNG variants of their cars for commercial use. And to make the ownership costs of the Santro lower, Hyundai is starting a new service program, wherein Santro owners will get priority in service with the promise of returning their cars the same day, as well as a class-leading 3 year/100,000 kilometre warranty as standard. In short, the Santro has a lot of things working in its favour. Sure, in terms of design, it does have its quirks – but so did the original, and that worked quite well for it. The engine, meanwhile, is refined and suits the car well, while the new, and much-needed, steering feel is an added bonus. And did I mention that the AMT is truly class-leading? Moreover, given the quality and equipment levels of the car, as well as the Santro brand name, this new model provides great value for money too. Honestly, I think the Santro, with its excellent space management and positioning, is well poised for a bright future. So, all you Santro lovers out there – and there are lots of you – know what to do. X-Factor: With a legendary brand legacy, and an excellent package, the Santro makes a triumphant return to the Indian market.